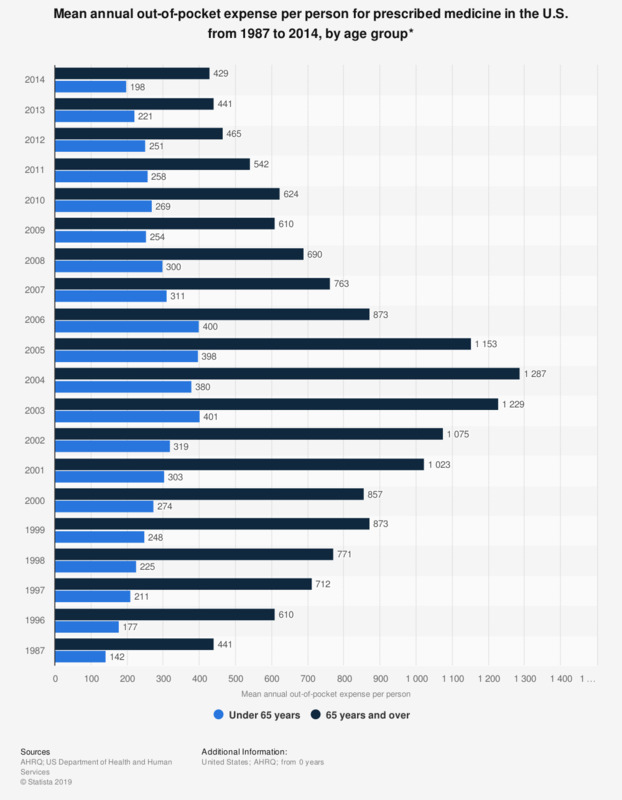 This statistic shows the mean annual out-of-pocket expense for health care and prescribed medicine per person with out-of-pocket expense in the U.S. from 1987 to 2014, by age group. In 2014, the mean annual out-of-pocket expense per person under 65 years came to 198 U.S. dollars. * Per person with out-of-pocket expense. Estimates of expenses were converted to 2014 dollars using the Consumer Price Index (all items) and differ from previous editions of Health, United States. Which of the following conditions, if any, have you been prescribed medication for on the National Health Service (NHS)? Do you agree with the fact that it is dangerous to buy drugs online from foreign wesites because the products can be counterfeits? Do you personally use the internet to learn more about a medication that you have been prescribed and that you plan to buy?